A feel good group for anyone, where you can have fun with a touch of madness. 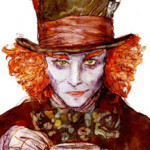 Join us at the Mad Hatter's Table for picture games, puzzles, party's, travel, food and awards. We are animal friendly as well. Requires application.